Back when the Spaces feature debuted in OS X 10.5, it marked the first time virtual desktops were built into a mainstream, consumer-oriented operating system. By letting you create multiple workspaces, each with its own applications and windows, Spaces offered a new way to deal with all the clutter of multiple programs running on your Mac. Spaces wasn’t used as widely as OS X’s Exposé feature, but it became quite popular with a good number of users. Then Apple essentially killed the feature in Lion (OS X 10.7), replacing it with Mission Control. 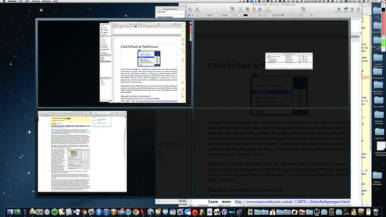 Though Mission Control also allows you to have multiple workspaces, it’s much less flexible. 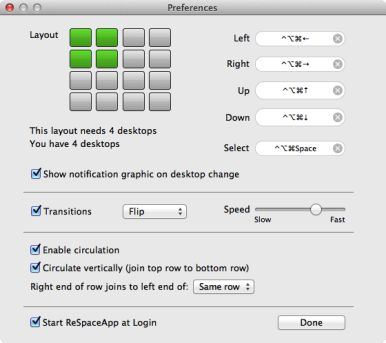 For example, Spaces let you configure up to nine permanent workspaces in a 3-by–3 grid—so you always knew the virtual location of a workspace—and let you easily navigate those workspaces using keyboard shortcuts; Mission Control arranges workspaces in a single, left-to-right virtual line, and a particular workspace may disappear if you close all the windows and apps in it. In other words, it’s no longer easy to create, say, a writing space and know exactly where it sits and what it contains. ReSpaceApp is a new app, currently in beta, that aims to bring back much of Spaces’ functionality, but it does so by using Mission Control for the underlying functionality—it just changes the way your Mission Control workspaces appear to be arranged. When switching workspaces, ReSpaceApp displays a smaller, Spaces-like representation of your workspace grid with an arrow pointing from the current workspace to the destination workspace. You can even choose the transition used when switching—Slide, Cube, Swap, or Flip—and the speed of that transition. As with Mission Control, switching to an app switches you to the workspace containing that app’s window(s). If an app has windows in multiple workspaces, each time you click that app’s icon in the Dock, you cycle between those workspaces. ReSpaceApp is still in the beta stage, so it’s still got some quirks. For example, while ReSpaceApp arranges your workspaces in a grid, these are still Mission Control desktops under the hood—if you enter Mission Control, you’ll see them arranged linearly. Which means that on a laptop, or if you’re using a Magic Trackpad, you can use a multi-finger swipe to the left or right to switch between those workspaces, but not up or down. This can quickly get confusing. 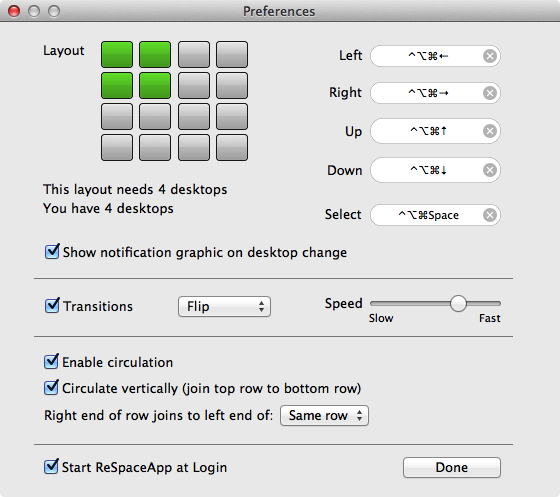 Another issue is that if you enable ReSpaceApp’s Circulation feature—which allows the aforementioned capability to drag a window against the edge of the screen and circulate through all workspaces—full-screen apps aren’t navigable using ReSpaceApp’s shortcuts. But if you disable Circulation, which then allows you to access full-screen apps by going past the right-most workspace as you would in Mission Control, you can no longer easily move a window to a workspace at a different vertical level. The developer has indicated that improvements to full-screen-mode compatibility are in the works. There are also a few minor issue. For example, the program’s preferences window frustratingly disappears whenever you click away from it. And while making a larger workspace grid prompts you with an Add More button to create the additional workspaces, moving to a smaller grid (one with fewer workspaces) alerts you than you currently have more, but doesn’t provide you with a way to delete the extras. I’m looking forward to updates to ReSpaceApp. I’m still a fan of Spaces, and I’ve been disappointed in Mission Control’s approach to multiple workspaces. With some improvements, ReSpaceApp could deliver the best of both Spaces and Mission Control.